The Health Science Center Library welcomes reservations from all HSC faculty, staff and student groups. Reservations are on a first-come basis. Requests can be made within the same calendar year as the event date. Requests for January event dates can be made in December of the previous year. The Collaboration Center (C2-41A) may be used between 8am and 4:30pm, Monday through Friday. Biomedical Information Teaching Space (BITS@HSCL) (C1-121) may be used from 8am and 5pm, Monday through Friday. You will be sent an e-mail confirmation within 2 business days. Food and drinks are permitted (Thank you for keeping the rooms clean!). For special assistance with access (i.e., ADA), please visit the Information Desk on the first floor. For further information or to cancel your reservation, please call the Director’s Office at (352) 273-8400 or use the form below. 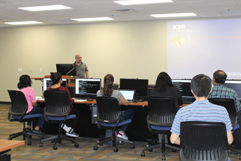 Biomedical Information Teaching Space (BITS@HSCL) (C1-121): 50 Windows machines with an extensive suite of software, teleconferencing capabilities, EndNote, ABS Browser & Citrix Receiver. Collaboration Center (C2-41A): 90” monitor with teleconferencing capabilities, whiteboard walls, wireless keyboard / mouse, large conference table. Room comfortably seats 25. Check the time and date availability on the room calendar below (the calendar will open in a new window), then fill in the form to reserve the Biomedical Information Teaching Space (BITS@HSCL) (C1-121) or the Collaboration Center (C2-041A). After submitting the form, scroll down on this page to verify it has been successfully submitted. If you do not see a message that states 'Thanks for contacting us! We will get in touch with you shortly' there has been an error with your submission, and the problem field will be highlighted in red below. List of current software available at https://labs.at.ufl.edu/about-at-labs/computer-software. Software Requests must be made through Academic Technology no later than one month prior to the first meeting date via https://classrooms.at.ufl.edu/request. Library staff do not have permission to install software on the BITS@HSCL machines. Software Requests must be made through Academic Technology no later than one month prior to the first meeting date via https://classrooms.at.ufl.edu/request. You are requesting to meet every weekday (M-F) at the time, date and end date indicated above. You are requesting to meet weekly at the time, date and end date indicated above.